A lot goes on in modern nations—education, banking, health care, business and industry, energy production, transportation, communication, science, national defense, sports, entertainment, religion, and on and on…. And there’s a lot of debate (at least here in the States) about governments’ appropriate role in all of this activity. When is it better (in terms of peace, prosperity, progress, fairness, vitality…) for government to get involved with rules and regulations, policies and punishments? And when is it better for governments to step back and let people and their groups interact freely? When regulation is appropriate, to what degree should governments regulate? As mentioned in previous posts, it’s mostly our noble-savage nature, which has been with us for a long, long time, that keeps stirring up this endless debate over what’s more important—the rights of individuals to be free or the rights of societies to be kept stable and equable by an effective government. Most people would probably agree with at least one point: If there’s going to be a military, it should be managed by government. Private interests in charge of military force would be tempted to run society in their own best interests (especially in market economies, where self-motivation is the way of doing business), neglecting society at large… creating a fascist state. 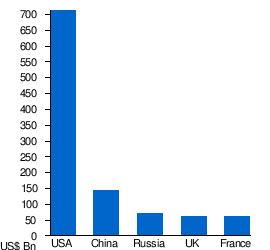 So… how much of a nation’s government budget should be used for military spending? Well, once again, if this were a noble world run by trust and good will, there would be no need for a military. Nations, by nature, would get along, share and cooperate. If it were strictly a savage world without rules, rife with competition—a world of fear and mistrust—then every country’s survival would depend on a strong military. Weak nations would be defeated and absorbed by strong nations. The general rule in this material world is, the more you own, the more you have to protect. The bigger economic powers of the world, then, have more to protect, and in many cases are inclined to spend more for military development. A country in this brutal world needs to find a healthy balance between supporting its military strength and supporting its social infrastructure of people and products (everything from transportation and communication networks to the food items on the market shelves). Spending too little on “defense” can make a country weak, and spending too much can also weaken it. The human body is a good example of that. Our immune system is our body’s version of a nation’s military. It fights off invaders such as bacteria and viruses. Nations should support their militaries by the same rule. Keep their military spending to a minimum until it’s needed. Then mobilize… as the US did after being attacked at Pearl Harbor during World War II. Don’t give in to fear, though… as the US has been doing since the 9/11 attack on the World Trade Center. There are too many other important things in life to spend the government budget on. Noble things, such as health, education, welfare, and other services that strengthen the nation by strengthening the people. Military is a savage expenditure, driven by fear and hatred. There’s no quicker way to weaken a country than through excessive military spending. It’s usually the result of living in fear… and fear is the biggest energy sucker for any living thing. Fear can undermine a person’s life purpose, and it can ravage a nation’s economy. Think nobly, live nobly!… whether you’re a human being or a nation. Spend your energy (and money) on the beautiful things in life. This entry was posted in Politics and Economics, Society and ethics, Worldly matters and tagged immune system, military spending. Bookmark the permalink. I recommend a reading of some of the recent writing on my website. Here is a good one to start with: http://haelanlifestream.com/wordpress/the-seekers-compendium-part-iii/. There are 3 videos in this Journal which will expand on the theme you present above. That’s an amazing article you wrote on your blog, “Crestone and Beyond,” with links to moving sites. If you ever open up to subscriptions, I’ll be on that list. Meanwhile, thanks for the occasional reminder to ‘go visit,’ as those visits are always enlightening.